Now, I feel a little better so let’s get on with this post. In challenging times like these, opportunities to learn about leadership abound. Yesterday, two high profile government leaders wrote letters to Congress in advance of hearings that took place today about the Scandal and several days earlier, Edward Liddy, the CEO of AIG, wrote the letter that sparked the controversy. I thought it might be instructive to look at the language and style that these leaders used in their respective letters to address the problem and deliver their messages. Let’s throw in a little compare and contrast as well. Throughout the post, I will bold and underline words or phrases for emphasis. At the end of this post are links to PDF’s of the letters. First, the similarities. The letters were written by high profile organizational leaders: Edward Liddy, chairman and chief executive officer of AIG, Timothy Geithner, Secretary of the Treasury and Andrew M. Cuomo, New York Attorney General. As mentioned previously, they were delivered in advance of Congressional hearings on this controversial matter. The Geithner and Cuomo letters are dated March 17, 2009 and Liddy’s is March 14, 2009. All are three (3) pages long. Thank you for the open and frank conversation on Wednesday regarding the compensation arrangements at AIG Financial Products and AIG generally. I admit that the conversation was a difficult one for me. He then frames the context in which he finds himself; a bit of an honest CYA. I do not participate in any AIG bonus or retention program, have never attended a single AIG sales event or conference and, before September, did not have any relationship with AIG. I was asked to serve by your predecessor in connection with the acquisition by the government of almost 80% of AIG’s outstanding shares. My only goals are to have AIG repay, with interest, to the maximum extent possible, the assistance the American taxpayers have given it and to continue AIG’s main insurance companies as strong, thriving businesses and contributors to the economy. My only stake is my reputation. I would not be doing my job if I did not directly advise you of my grave concern about the long-term consequences of the actions we are taking today. On the one hand, all of us at AIG recognize the environment in which we operate and the remonstrations of our President for a more restrained system of compensation for executives. On the other hand, we cannot attract and retain the best and brightest talent to lead and staff the AIG businesses – which are now being operated principally on behalf of the American taxpayers – if employees believe that their compensation is subject to continued and arbitrary adjustment by the U.S. Treasury. My team and I will stand ready to do everything we can to work together with you to reach a resolution that is in the best interests of AIG and its stakeholders. I know that there is considerable outrage in the House of Representatives[1. Interestingly, the first version of this letter that I downloaded from the Internet and which you can download, started “I know that there is considerable outrage in the Senate” even though Congresswoman Pelosi is the Speaker of the House. (see attached) Obviously, this was just a typo, but it makes you wonder how this can happen in the first sentence of such an important letter regarding a really hot potato political issue.] as there is throughout the country, about the bonuses awarded to employees of AIG Financial Products division at a time when the company is reliant on significant taxpayer dollars. The President shares that outrage, and so do I. As would be expected, he then lays out exactly why he is writing this letter in the second paragraph. I am writing to outline the steps taken by the Department of the Treasury to date, to update you on the actions we are taking to recoup the retention payments just made, and to deal with future payments of executive compensation by AIG. In the next few paragraphs, Geithner advises that he expressed “strong objections” to the current AIG CEO Edward Liddy after he was informed of the bonus the week prior by his staff and lays out his only details about the bonuses. Strangely, midway through this section, he begins defending/excusing/protecting AIG CEO Liddy. Mr. Liddy, who took the reins of the firm after the bonuses were negotiated in April of 2008, said AIG’s lawyers had concluded that the contracts were legally binding. While Mr. Liddy may be late to the AIG party and not at all culpable regarding the awarding of bonuses, it does seem odd to make the point so early on in a three page letter which later follows with an even stronger defense. The next paragraph confirms that Treasury lawyers agree with the AIG lawyers’ opinion “that it would be legally difficult to prevent these contractually-mandated payments” and Geithner “demanded” that Liddy basically put a stop to future payments. He then writes what I found to be a very odd sentence for a leader of his authority and stature. As you know, the President has asked me to fully review all additional measures at my disposal to recoup these bonuses and to recover funds on behalf of taxpayers. This sentence is lacking in authority and leadership. While Geithner as Treasury Secretary may be an agent for the President, a leader at any level needs to present ownership and control of the situation. We also want to insure that taxpayers are compensated for any monies we cannot recover. Therefore, as part of our provision of recently announced taxpayer funds, we will impose on AIG a contractual commitment to pay the Treasury from the operations of the company the amount of the retention awards just paid. In addition, we will deduct from the $30 billion in assistance an amount equal to the amount of those payments. I assume that he meant “recover” directly from the AIG FP employees in the former paragraph and since the government currently owns 80% of AIG, are these penalties laid out in the latter paragraph really effective? In the middle of the second page, Geithner departs from the specifics of the AIG retention bonuses and presents a policy position on financial regulatory reform. While this is obviously important and timely, this policy discussion defuses the focus of the letter. In the next to last paragraph Geithner again embarks on a defense of Liddy though this time it is more robust than the previous one. Again, while Liddy is in no way culpable for the current AIG Scandal, to me this defense is a little over the top. Most important for the long-term health of the credit markets that are key to the economy, I look forward to working with Congress to modernize our financial regulatory system in way that protects the American taxpayer, meets the challenges of a dynamic global market and reduces the chances that we will face a financial crisis of this magnitude in the future. This close seemed rather general and more policy oriented than the states purpose of the letter. Finally, New York Attorney General Andrew Cuomo’s letter starts with a very focused and authoritative tone. I am writing to provide you and your Committee with information regarding an ongoing investigation my Office has been conducting of executive compensation at American International Group (“AIG”). I hope this information will be useful to the Committee at its hearing on AIG tomorrow. We learned over the weekend that AIG had, last Friday, distributed more than $160 million in retention payments to members of its Financial Products Subsidiary, the unit of AIG that was principally responsible for the firm’s meltdown. Last October, AIG agreed to my Office’s demand that no payments be made out of its $600 million Financial Products deferred compensation pool. While this was a positive step, we were dismayed to learn after the fact that AIG had made multi-million dollar payments out of its separate Financial Products retention plan on Friday. Cuomo make it clear in the very first sentence that there is an ongoing investigation and that while he recognizes and highlights the difference between deferred compensation and retention bonuses, he obviously feels that AIG has reneged on an agreement in principle. While Liddy and Geithner rely on inside and outside counsel regarding the risks of not paying the contracted retention bonuses, Cuomo make it clear that there could be other avenues to explore or negotiate. AIG now claims that it had no choice but to pay these sums because of the unalterable terms of the plan. However, had the federal government not bailed out AIG with billions in taxpayer funds, the firm likely would have gone bankrupt, and surely no payments would have been made out of the plan. My Office has reviewed the legal opinion that AIG obtained from its own counsel, and it is not at all clear that these lawyers even considered the argument that it is only by the grace of American taxpayers that members of Financial Products even have jobs, let alone a pool of retention bonus money. I hope the Committee will take up this issue at its hearing tomorrow. 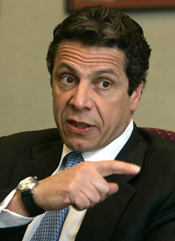 Cuomo, like a good attorney, chips away at the credibility of AIG’s arguments for paying the bonuses. Furthermore, we know that AIG was able to bargain with its Financial Products employees since these employees have agreed to take salaries of $ I for 2009 in exchange for receiving their retention bonus packages. The fact that AIG engaged in this negotiation flies in the face of AIG’s assertion that it had no choice but to make these lavish multi-million dollar bonus payments. It appears that AIG had far more leverage than they now claim. AIG also claims that retention of individuals at Financial Products was vital to unwinding the subsidiary’s business. However, to date, AIG has been unwilling to disclose the names of those who received these retention payments making it impossible to test their claim. Moreover, as detailed below, numerous individuals who received large “retention” bonuses are no longer at the firm. While he clearly does not have all of the information he would like, he has enough to provide details that strengthen his arguments and weaken AIG’s. In one of the final paragraphs of Cuomo’s letter, he frames the issue and makes his position clearly known. Again, these payments were all made to individuals in the subsidiary whose performance led to crushing losses and the near failure of AIG. Thus, last week, AIG made more than 73 millionaires in the unit which lost so much money that it brought the firm to its knees, forcing ~ taxpayer bailout. Something is deeply wrong with this outcome. In the next to last paragraph Cuomo sends a threatening message to AIG. We have also now obtained the contracts under which AIG decided to make these payments. The contracts shockingly contain a provision that required most individuals’ bonuses to be 100% of their 2007 bonuses. Thus, in the Spring of last year, AIG chose to lock in bonuses for 2008 at 2007 levels despite obvious signs that 2008 performance would be disastrous in comparison to the year before. My Office has thus begun to closely examine the circumstances under which the plan was created. Of the three letters, Treasury Secretary Geithner’s is by far the weakest. The typographical and grammatical errors in the first and last paragraphs create poor first and closing impressions and undermine the professionalism that must exhibited at this level of leadership. Drifting into a policy argument in the middle of the letter also hurt. Geithner often has that “deer in the headlights” look when you see him on TV and unfortunately that comes across in his letter as well. Cuomo’s letter is very aggressive and threatening and while that might appeal to some, it will turn off many more. This posturing certainly goes with the job; one doesn’t have to look back too far before seeing Rudy Guliani and Elliot Spitzer use similar theatrics to advance themselves to higher offer. Cuomo’s intertwining of facts with opinion make for a strong case but we’re looking at these letters from the perspective of leadership, not law. Interestingly, Liddy is the oldest and most experienced executive of the three and this comes across in his letter. He graciously stepped forward and out of retirement to take a leadership position in an extremely challenging situation. He’s aware of the political challenges and presents an appearance of a command of the business ones. From start to finish his letter is strong and balanced. We have few opportunities to witness first hand the challenges and opportunities that leaders at this level face. Letters like these take thought and time to write and therefore they give us a valuable glimpse into the minds of our leaders. It’s also an interesting personal exercise to try to read them with nonpartisan lenses. I’m certain that many Weekly Leader readers will have different thoughts and insights on these letters and I hope that they will share them below. Tagged with AIG, New York.